Initially settled by the Spanish, San Diego borders Mexico and has plenty of cultural nods to that country. Cabrillo, who first discovered the region at San Diego Bay, is honoured at Point Loma which overlooks the bay with his statue. Take a walk along the shore line for the tide pools here, full of sea life, and easily spend an afternoon of free fun. San Diego has a lot of naval associations and with its deep harbour it is easy to understand how the city grew from the harbour outwards. It still retains a great deal of this marine history with daily harbour tours, and the USS Midway Museum which is actually a naval aircraft carrier – a great day out for children and adults alike. Down along the harbour you can also find Pirate Ship Adventures which children of a certain age love. Old Town San Diego Historic Park recreates life from 1821 in the days after Cabrillo, during the Mexican and early American periods. You can get a trolley tour with a guide which is a good introduction to the city and its roots. You can even nip over the border to Tijuana, Mexico to buy souvenirs, you are so close! There are many attractions in San Diego without travelling too far beyond the city limits, and the great thing is that they don’t all have a price tag. Take the Spreckels organ pavilion – a gift to the city dating from 1914, this organ of 4,518 pipes blasts out the tunes each Sunday at 2pm for free. Or take to the cities beaches; Pacific, Ocean or Mission, you are bound to find your own open space which you can take a picnic along to. 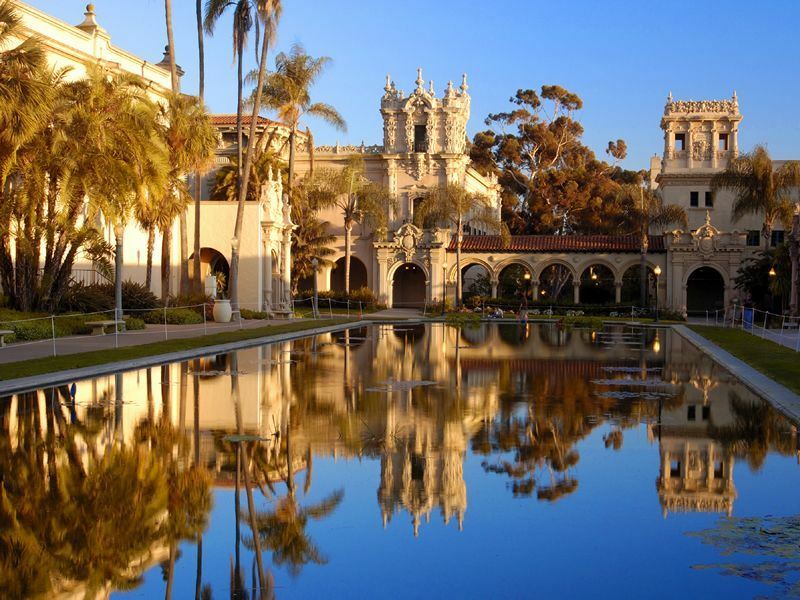 Whilst in the city try Balboa Park with its beautiful gardens and children’s play area, it is a good place to kick a ball around and eat lunch. For horticultural enthusiasts try the Botanical building with 1,200 tropical plants. Just outside the immediate city there is trekking at Torrey Pines State Reserve (and wild beautiful beaches) or try the Mission Trails Regional Parks for fishing and camping. There are some stunning migrating birds which make use of the lagoon at Torrey Pines and in all of San Diego’s parks you will be aware of the wildlife encouraged to thrive there. Enjoy Sunset Cliffs National Park at the end of the afternoon and hear the bird chatter all around you. Quite beautiful and amazing to be so near the city! Whilst in San Diego you may want a more cultural evening and in which case we recommend the Old Globe Theatre or for comedy improvisation try the National Comedy Theatre. Both are popular and attract visitors and residents alike, and hold theatrical events you may be interested in – get a hold of the listings from your hotel’s concierge. Other entertainment including movies, shopping and dining can be found at Seaport Village on the waterfront. Any trip to San Diego would be incomplete without at least a day in the San Diego Zoo. With enormous conservation projects, daily lectures to broaden your understanding of the animal kingdom, simple meet and greet with the animals or watching the “reptile walk”, there are many attractions and activities. A zoo tour takes you behind the scenes – last month baby jaguars were born and this kind of “event” happens all the time across the mini animal kingdom they have here. There is also a safari park where you can feed the giraffes and you can even arrange to spend a night at the zoo, which feels like something Ben Stiller might do. Definitely plan on visiting the zoo for a couple of days, as if it was Disneyland, which it is, it’s just that everything is alive! Downtown San Diego can become very busy when the baseball is on at Petzo Park, a major league ball park. If you are remotely interested in watching sport get tickets for any game which is on during your stay; get a jumbo hot dog, mammoth fizzy drink and sit back and enjoy the American Way. Your American Sky consultant can help you plan San Diego into your USA trip and book any San Diego tour, accommodation or car hire necessary to ensure you make the best use of your holiday time. Further reading: If you plan on visiting the Californian city sometime, take a look at our list of top 10 things to in San Diego to see what you’ll be up against.